The United States Congress designated the Kofa Wilderness (map) in 1990 and it now has a total of 516,200 acres. All of this wilderness is located in Arizona and is managed by the Fish and Wildlife Service. The Kofa Wilderness is bordered by the New Water Mountains Wilderness to the north and the New Water Mountains Wilderness to the north. In the early part of the 1900s the King of Arizona (KofA) Mine scoured this land for precious mineral deposits. 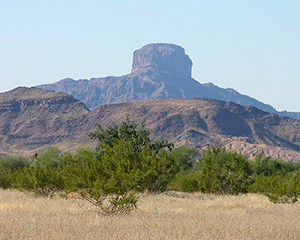 Today, in a twist of fate, the Kofa National Wildlife Refuge and subsequently Kofa Wilderness protect the region's precious plant and animal life, including: one of the Arizona's largest desert bighorn sheep populations, a species nearly extirpated prior to the Refuge's establishment; Sonoran pronghorn, a federally endangered pronghorn sub-species, less than 100 California fan palms, remnants of wetter days; and the rare Kofa Mountain barberry, found only in southwest Arizona. Kofa Wilderness makes up approximately 82% of the Refuge, making this Wilderness Arizona's second largest. In the north lie the Kofa Mountains, to the south the Castle Dome Mountains. Both are magnificently jagged peaks looming thousands of feet above the pristine desert floor of King Valley, which separates them. The Kofa Refuge and Wilderness is open to visitation year-round, 24 hours a day. There are no entrance fees and visitors are free to camp wherever they choose, keeping in mind the vehicle restrictions. The vast majority of the public comes to the Kofa Wilderness between October and March when 'winter visitors' flock to southern Arizona. These 'snowbirds' as they are also called, tend to remain on or close to the designated roads. Thus, intrepid hikers can still find vast areas of the Refuge to themselves. The Refuge is virtually devoid of human activity during the hot summer months. The Refuge was established primarily for conservation of desert bighorn sheep and their habitat. This is still one of the primary management objectives. Subsequently, wilderness visitors are apt to encounter man-made structures such as concrete dams, windmills, and other modified or enhanced water sources. Many of these structures, built in the 1940s and '50s, have been allowed to slowly deteriorate, while others are maintained by Refuge staff to provide essential water needs for desert wildlife. On occasion wilderness solitude may be interrupted by the sounds and sights of aerial overflights as Refuge staff conduct wildlife surveys. The airspace over the Refuge is controlled by the military; thus, you may also see and hear military jets and helicopters during your visit. By and large, however, the remoteness and solitude of Kofa's backcountry is unmatched by other, more heavily-visited wilderness areas. Planning to Visit the Kofa Wilderness? How to follow the seven standard Leave No Trace principles differs in different parts of the country (desert vs. Rocky Mountains). Click on any of the principles listed below to learn more about how they apply in the Kofa Wilderness.